Let me tell you a story about a troubleshooting incident I encountered a few weeks ago. The other day I was trying to use the Microsoft Terminal Services Client (mstsc.exe) to remotely connect to a PC in Los Angeles, California but for some inexplicable reason I couldn’t connect. Well that’s not entirely true; the client actually crashed on connect. The Remote Desktop connection has stopped working. The error is pretty lame if you ask me. Here’s the thing: it’s already obvious that the Remote Desktop connection stopped working because the client was completely locked up. Therefore, why does Microsoft need to rub it in my face by telling me what is already undeniably true? So yes, I was perturbed. I tried immediately connecting again (just to see if the error would go away) but I got the same result. Rebooting didn’t fix anything so I asked a friend to attempt to connect to the same remote computer. Guess what? He didn’t have any issues. He connected fine and looked at me like I was stupid. So there was something on my computer that was causing the Remote Desktop application to quit unceremoniously. 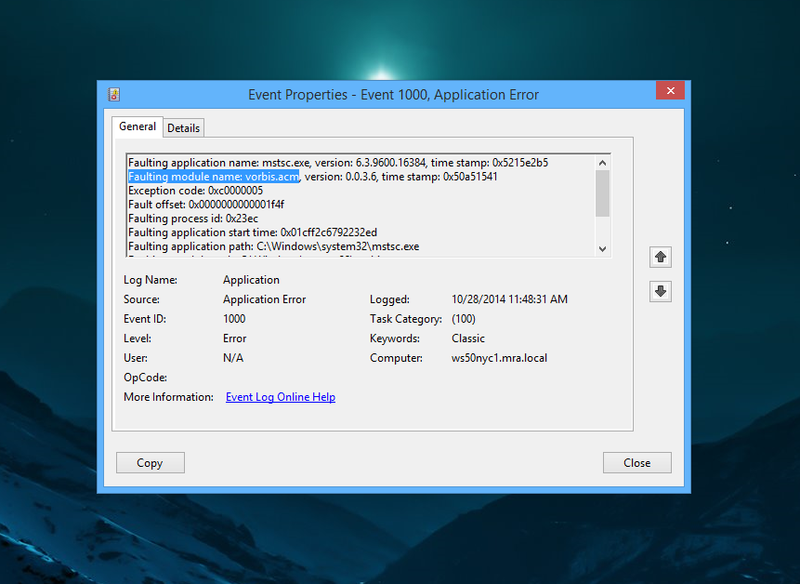 When I looked in the event logs I could see mstsc.exe was the faulting application name. But I already knew that. There was also something in there about vorbis.acm. How odd… what is that? Vorbis… vorbis… where have I heard that before? Isn’t that an audio codec or something? I started Googling around and noticed that vorbis, sometimes called Ogg Vorbis, is an open source audio coding format. But it wasn’t obvious to me what an audio codec and the Remote Desktop Client had in common. I perused the General tab… nope nothing here. Oh wait.. what is this? 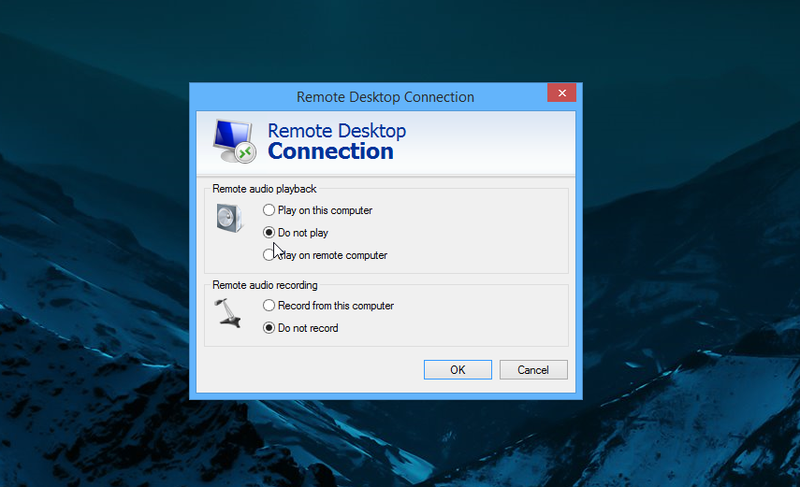 Remote audio… configure remote audio settings? Ah, maybe there’s something in here I need to disable? When I clicked in the Remote audio playback settings I noticed Play on this computer was selected. Since I don’t care about the audio at the destination playing back on my local computer, I selected Do not play and attempted to reconnect. That fixed it! I connected without any issues and the Remote Desktop client stopped crashing. 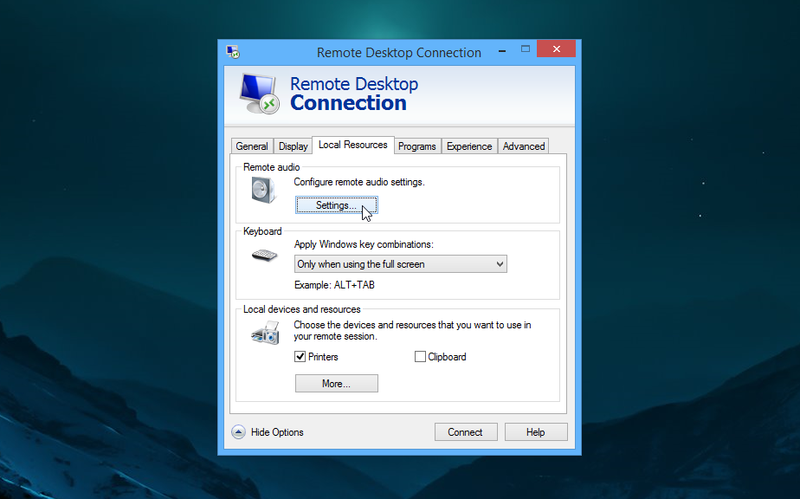 If you’re having a similar issue try poking around in the Remote Desktop settings to see what you can disable. I know some people were able to fix the Remote Desktop client problem by disabling Printers under Local devices and resources. You might be able to to solve the problem by backing up the cached bitmapped images of previous remote sessions. Basically, if you repeatedly connect to the same computers that have the same desktop setups, the terminal service client will save a cached copy locally on your system so you don’t have to keep downloading it from the remote computer. You could rename the .bmc files to .bmc.old and then retry your terminal services connection efforts. I have to be real with you though: I haven’t tested this bmc thing so I can’t tell you any expected outcomes! Please let me know what worked for you. Yes, I have the same problem and your solution works for me ! Thank you very much !! Fonzie.. seeing his thought process as he walked through the problem can help others follow a similar process for related, but different issues. You’re one guy, so you’re in no position to speak for everyone else. Filter out the sh*t next time you write a comment. It’s a year ago, but jeeze…….stfu. It’s a short article, and there’s nothing wrong with his style. FU Fonz, from the future. Ran into this problem today, this fixed it. Sort of strange, it was working until today. Even i am facing this same issue. Have tried all the options mentioned above, but still getting same error. Any suggestions. Disabling sound didn’t work for me but disabling local print did the trick. Here is already value are set 0 at enabled location. Where I change the value at default or Enabled location? Good Morning. Thank you for your reply. I have used PGina and when i removed it then it’s worked fine. Had the same issue. Your post solved it. Greatly appreciated! i should add… this worked for windows 10 as well. %USERPROFILE%AppDataLocalMicrosoftTerminal Server ClientCachebcache64.bmc did the trick. It took me 3 weeks to use the correct search keywords in google to find that easy solution on your site. Hoorrrraaay! Next beer is on me. Thanks a f**king lot! Yay! Deleting that .bmc file in %USERPROFILE%AppDataLocalMicrosoftTerminal Server ClientCache didn’t work but deleting the other 3 Cache files in that dir fixed the crash for me that just randomly started happening today. Go to your local hard drive then find the username you are looking for then also you need to enable hidden folders. do this by going to “View” on windows 10 . Then you will see AppData and from there it should be simple. Let me know if you have any more questions. Steps seems to be too technical. Instead, tools like R-HUB remote support servers, gosupportnow, logmein etc. are user friendly and easier to use. nailed it, mark another one up for audio redirection bork’d on windows 10. RDP audio redirection from a windows 7 target works great on the iOS app for iPad but not mstsc.exe in windows 10 destkop. welcome to 2015 and mobile/web 1st. i guess i do use the iOS app more but really?!?! Renaming the cached files worked for me. Thank you. Thank you for the “Do Not Play Audio” tip. That was the answer for me!!!! disabling printers works for me. Thanks for sharing! Thanks for the workaround, works like a charm for me! OMG! Thanks! This was bothering me for several months. You just made my day. Disabling printer sharing worked for me, thank you so much! I believe the key to solving this issue specific to each case is looking in the event viewer. Look at not just the “Faulting application name” but also the “Faulting module name.” For me the faulting module was “dlxcrjdm.dll” which is an old Dell Printer Driver dll that I am guessing isn’t compatible with Windows 10 (which I just upgraded to). Anyway, after uninstalling the Dell printer, my problem was resolved. This type of approach may also solve the issue for those looking to use printers or audio as a local resource in the remote environment. To run event viewer, just hit the Start button and start typing in “Event Viewer.” You should be able to see in the “Summary of Administrative Events” any Errors (under “Event Type”) in the last hour and then find the one related to your issue. After you do find the “Faulting module name”, I suggest googling it to find out what it is and go from there. Victor makes a good point – definitely check the event viewer. sdrdp5.dll was the cuplrit for us. Simple fix. I had the same issue and none of the above fixes helped so I simply created a new user and that fixed my problem. Amazing. I’ve been trying to fix during several months and it worked out (the audio off option) and this was in Windows 10, so I wrote to let you know that it also works in W10. Thanks a lot!! I’m on Windows 10 and this worked for me – disabled audio. Thank you!!!! I am not computer literate so how do I disable autologin and how do I find registry value as the other steps did not correct the problem? Audio setting worked for me. Thanks bro. Excellent that worked perfectly. Thanks for working out the problem and sharing the solution. It is solution for my problem – thank you. This. It fix my wifi log in windows explorer crash problem. Thank you! tried literally everything else, only this worked! Thanks!!! Great Solution! I deleted the CSR software and Remote is running again. I have had other problems with that software, should have dumped it months ago. Thanks, Nick! If the crash happens in ntdll.dll (as was in my case), the chances are high it is related to the mentioned BLEtokenCredentialProvider.dll (just renaming it is enough to avoid crashes). The real cause of the crash can be tracked down by analyzing the dump file like mstsc.exe.6804.dmp (for Windows 7 they are accumulated in ? :UsersXXXXAppDataLocalCrashDumps by default). THANK YOU! It solved my problem too! I didn’t have that Vorbis error but I just went on a limb and tried disabling audio. Worked immediately! Thank you! To test if the problem really was about the Vorbis codec, I opened a Media Player on the remote computer. As soon as I played a file, the Remote Desktop crashed. I set the Audio to Do Not Play, and it fixed for me. Googling tells me that Vorbis.acm is not compatible with 64-bit mtsc.exe version. In the Windows Application event log I found it was a newly installed HP printer on the network causing my RemoteApp RDP session to crash within seconds of starting. I disable Printers as a shared resource. Didn’t work with disabling the audio, but it worked by disabling the printer. Thank you so much for such a simple solution to an annoying new problem! Disabling printer share worked for me! Thank you. Brilliant, this worked for me on Win 10 Pro, thanks so much. This post pointed me in right direction. Found out user was using old printer driver that was responsible for crashing RDP connection. Win7 driver working on Win10 – compatible but not best solution! After upgrading the driver, printer share was back to normal. Thank you for this post! I had same problem, and it was fixed after I disabled the printers! Wanted to chime in as i was having the same issues, i had “Faulting module name: ntdll.dll” in my event log. After disabling UAC, no more crashes! I’ve had continuous disconnection problems with Remote Desktop from a Win10 to a Win7 machine, where the connection dropped every time I used windows explorer on the host machine. I turned remote audio playback to ‘do not play’ and I also disabled ‘Printers’ under local devices and resources. No more disconnecting now! Works like a charm on Windows 10, thanks. Thank you! I had to turn off printers and clipboard too (not sure which did the trick). You saved my life with audio config!!!!!!!!!!!!!!!!!!!!!!!! Note: I’m referring to deleting the cache files. NOT the audio.